The most common type of elbow injury that we see at the clinic is either a 'golfers elbow', or a 'tennis elbow'. In the absence of trauma we now understand that some of these may be acute in nature (with inflammation) and some more degenerate, like from overuse. It is important to understand this as they may need alternative types of treatment. As with most soft tissue injuries a vast majority of these will settle but what surgical options are out there if needed? 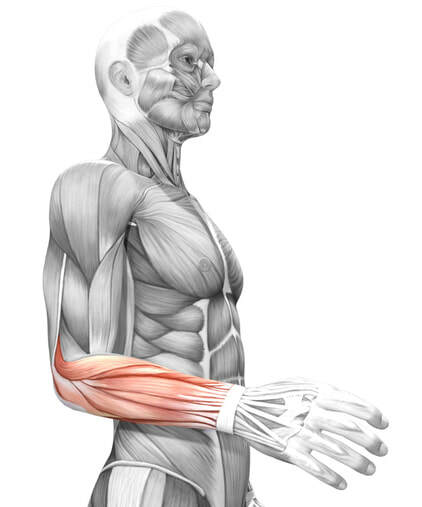 The extensor muscles of the wrist as they pass up to the outside of the elbow, before joining to the lateral epicondyle on the outside of the elbow, once they have transitioned into tendon form. ​Tennis elbow (lateral epicondylitis) presents as pain on the outside of the elbow and can caused by inflammation or degeneration of a muscle tendon of the forearm; the extensor tendon. It is only in recent years that research has shown that a higher proportion of Tennis Elbow is in fact caused by this decrease in tissue quality, strength and resilience to stress , causing pain by mechanical means rather than an inflammatory tendinopathy. In these cases it is normal for a self limiting cycle to occur with recovery expected anywhere between 6 months and 2 years. In cases where there is inflamed tissue, this may have been caused by repetitive strain, overuse or overload of the extensor muscles. It is not specific just to tennis players and can affect anyone carrying out manual repetitive tasks, including gripping and lifting at the wrist, that strain the tendon. Surgery, again is a last resort when conservative measures have not been successful, and pain persists. The procedure involves making an incision on the forearm near your elbow to allow access to the tendon. The tendon is explored where it is attached to the bone and any scar tissue is released or debrided, bony spurs found are removed, and any tears may be repaired or reattached by using sutures to attach the end of the tendon to the fascia (the tissue that covers the muscle). This procedure aims to exploring the region of the elbow where the ulnar nerve passes through, on its journey from neck to hand, and release any compressive forces that may be ‘pinching’ or causing irritation. This compression and damage to the nerve may be a by product of previous injury/trauma or fracture. Consequently, this could lead to arthritis or altered shape of the joint. Occasionally this altered shape can overstretch or squash the nerve and lead to permanent numbness and/or a tingling sensation in the little and ring fingers, as well as pain around the inside aspect of the elbow and forearm. In severe cases, or if it’s been a problem over a long period of time, there may be weakness of the muscles in the hand & fingers making function more difficult with finer movements, such as doing up buttons. Some conditions like diabetes can also affect the nerve function. The diagnosis of a peripheral nerve injury is usually confirmed by a nerve conduction test to confirm that the neuropathy (dysfunction of the nerve) is isolated to the ulnar nerve. This condition for most will get better with conservative treatment such as physiotherapy, use of anti-inflammatories and avoiding prolonged positions that exacerbate the symptoms. The last resort for persistent symptoms is to undergo the nerve decompression. The muscles where the nerve passes; the triceps (back of the upper arm) or muscles in the forearm can tighten and pinch the nerve. These sites can be explored and released under this surgical procedure creating more space for the nerve to pass in its track. ​These procedures are usually undertaken as a day case meaning you will be able to return home the same day. Sometimes a sling may be worn for a few days to aid with relief from the surgically related pain. Resting the elbow however, for too long can lead to stiffness, and exercises to do once home will be given to gently move the elbow and gradually strengthen the muscles. Avoiding heavy, strenuous and repetitive tasks for 4-6 weeks after surgery is advised. Recovery from both these procedures can be very slow and it can sometimes take at least the first 3 months to notice improvements, and at times 9-12 months before the arm feels the full benefit of the procedure. Physiotherapy post-operation is necessary to regain elbow range of movement and build up muscle strength to return to activity and function. We aim to provide up to date, accurate, information to patients (not fake news for personal gain) so please like and share this page, across your social media, so others can benefit as well. Please be aware that this may be seen and read by non clinical members of staff during the response process so limit personal or sensitive contents accordingly.